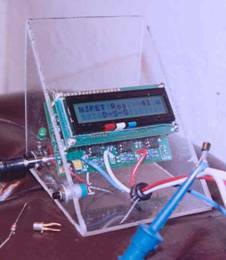 A workbench instrument capable of testing transistors, diodes, FETs, etc., can be pretty useful around the shack while constructing QRP circuitry. Prevents a lot of remedial unsoldering later if you misidentify leads and install a component backwards. Most all the semiconductor testers I’ve used over the past fifty years have commonly required that one first identify which leads are what – then insert the right leads into their proper socket slots before applying power to actually begin testing the device’s characteristics. The M3 is different: No test sockets! Instead it has three grabbers. Hook each grabber to a different semiconductor lead in any order you prefer without being concerned with which lead is a gate, a collector, an anode. The two M3 printed circuit boards include a pre-programmed microcontroller which sorts it all out, does all the device, lead identification and testing work for you. Then displays the results on an LCD. Have an unknown device? Hook up grabbers to your semiconductor’s leads and the M3 will display what the device is, which grabber is hooked to what lead, and will display the device’s essential characteristics on the LCD. Powered by a nine volt battery. Transistors, with or without an internal protective diode or base to emitter resistor. Checks diodes, LEDs, diode arrays, Darlingtons, both flavors of MOSFETs, junction FETs, Triacs, Thyristors, and Unijunctions. Automatically identifies pin-outs, finds internal shorts, measures leakage current, and lets you know if a transistor has germanium or silicon inside while measuring the gain. It is not an in-circuit testing tool. Kit costs about $55. A separate box for mounting your instrument is an option for $7. The box arrives pre-drilled for mounting the unit and LCD display screen. Has holes for the grabber lines. Can be spray painted whatever color you like. Kit parts were well packaged in five bags. Six pages of assembly instructions including graphics and diagrams make the soldering job straightforward and linear. Made a box for it from 3/32” Lucite Tuf® acrylic sheet stock from Lowe’s. Cut it out with a scroll saw. Glued box together with PROWELD from Hobby Lobby. Results in a strong, durable, non-yellowing container. Additional review of the kit is available . A very nice machine.